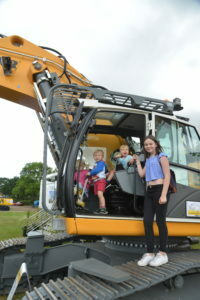 The IDE and NFDC recently held the third DemoExpo 2017 at the Herts Showground between the 22 and 24 of June 2017. Unlike the preceding shows, a third day was added at the request of many of the attending manufacturers. 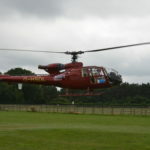 Fortunately, a spell of dry weather graced the show letting the visitors enjoy the attractions particularly on Family Day held on the Saturday. Almost all major manufacturers graced the event with Marubeni Komatsu showing their award winning PC390-11HRD to the public for the first time. Displayed in full 26m high reach configuration, the machine was only beaten for height by their larger PC490-10 model which was on display at Ridgway Rental’s stand. Komatsu were also keen to show the largest excavator in their Hybrid range, the PC365. Designed to save over 20% in fuel consumption on certain tasks, the 36 tonne machine was displayed alongside a PC290-11 excavator and WA320 wheeled loader in waste handling specification. Hitachi Construction Machinery arrived with a wide variety of equipment from mini, midi and large excavators and wheeled loaders. Hitachi showed just why they are number one excavator supplier in the UK with all the machines sporting customer liveries and destined for job sites directly after the show. Hitachi products were also being showcased on other stands with M O’Brien displaying a Zaxis 135-6 with short boom and 2.5 tonne Okada concrete processor, an ideal tool for internal and top down demolition. Demolition conversion experts Kocurek were also displaying a pair of Hitachi products with a 30t elevating cabbed machine destined for Pinder Waste sitting alongside a 100 tonne Zaxis 870 belonging to Manchester based PP O’Connor. The base machine had undergone the traditional Kocurek conversion for the undercarriage but the boom has been replaced with a heavy duty TAB boom enabling a range of positions to be worked at from a single machine. A 50m telescopic boom is also under construction to complete the unit. Caterpillar dealers Finning were also present with a range of material handling and demolition spec’d machines including a hybrid 1 tonne mini excavator ideal for confined spaces. Complete with a HPU300 electric generator which attaches to the machine’s blade, the excavator can also run off its standard diesel engine and is a first for Caterpillar in this range. Hybrid excavators were also present on the Atlas Copco stand with a Takeuchi TB216 sporting an integrated electric motor. The machine brought in a great deal of interest from visitors thanks to its compact design and has been purchased by a hire company with the intention of using it on basement excavations thanks to having a zero emissions motor. JCB as always showed up in force with a range of products including a crawler based material handler, something of a rare beast these days. 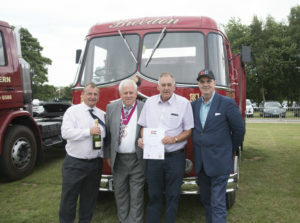 Mini, midi and full size excavator examples were on show with the show judges deeming the British manufacturer worthy of taking a joint award for the Best Stand. While the machinery on the JCB stand drew in the crowds, a special mention must go to their hog roast supplier! CPMS attended the show with a brace of Liu Gong excavators in NFDC company liveries including one of the first 50 tonne 950E machine in Brown and Mason livery. The Chinese manufactured kit is gaining a good reputation amongst the demolition fraternity with the latest examples certainly looking like they are now able to compete with established manufacturers. The CPMS stand was also home to their regular Irish Band who entertained visitors throughout the show. Liebherr GB attended the show in force with a wide range of excavators, wheeled loaders and a new tele-handler with the star attraction on their stand being an LH30 material handler in a giraffe inspired livery for Wards Recycling. Liebherr also had a 120t R 974C in demolition spec situated on the demonstration plot. A used machine from the Coleman fleet, the huge machine drew huge interest and has rumoured to have been sold at the show. Sporting a 15t LaBounty shear from ECY Haulmark, the outfit was easily spotted from the main road! For visitors wanting full sized crushers, both premium brands on the market were in attendance with Blue Group, Kleeman and Sandvik displaying the latest technology for the demolition and recycling industries. Kleeman’s UK dealer, Wirtgen also took advantage to display a small range of self propelled rollers. When it comes to attachments, the show didn’t disappoint with the largest names in the industry displaying their wares. Both leaders in the supply of hydraulic hitches ECY Haulmark and Worsley Plant were present and were joined by supplier of the ProQuick coupler BPH. 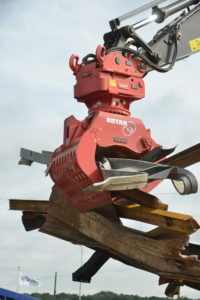 All three companies reported a busy show with orders being taken over the three days on their extensive range of attachments. The full Indeco range of equipment was on display including hammers and concrete pulverisers whilst Inmalo displayed a large range of Mantovanibenne equipment and the extremely popular MotoFog range of dust suppression equipment. Mutley Plant brought in a huge range of their Kinshofer and Demarec ranges of demolition attachments including an oversized dipper mounted crusher on a 13t Komatsu. Atlas Copco showed their range of attachments off on a beautifully crafted stand and included their huge 10t HB10000 hammer and CB2500 concrete cracker. Murray Plant, the UK Rammer dealer showed off a range of dedicated demolition tools and the popular Rammer range of hammers including the huge 9033 which walked away with a joint Innovation Award along with a new Okada concrete processor with built in magnet found on LDH’s stand. The stand also included the range of Dehaco dust suppression units and monstrous 5t selector grab and LDH’s David Hearne was pleased to announce the company had just been awarded the UK dealership for the Okada brand. For those looking for fixed concrete munchers MST displayed a heavy duty version alongside their demo spec buckets designed in conjunction under with AR Demolition for the OilQuick coupler. Staffordshire based Primal were also on hand with a wide range of fixed leg attachments, buckets and heavy duty rippers. The increased use of what are known as demolition robots saw both Husqvarna demonstrating two of their smaller units while at the opposite end of the scale Gnat UK showed off their latest acquisitions, two 13t Brokk machines complete with Lehnhoff couplers and Rotar attachments. For those wanting a less costly and more versatile choice, Irish ISP Remoquip showed off their remote control system which can be retrofitted to almost any excavator within hours to give it a fully remote controlled capability. 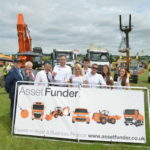 Occupying a large area of the showground, Lee Brenard’s Asset Funder proudly displayed some of the recent deals his company has assisted in funding including an excavator to M&M Demolition, a range of commercial vehicles and an impressive low loader combination to Yates’. 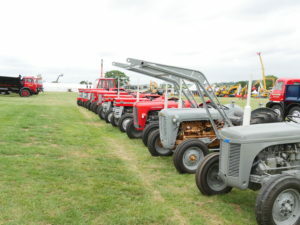 The outside area was completed by a range of impressive vintage tractors and commercial vehicles from McGovern, J O’Doherty and John Mould along with specialist construction recruitment agency Romax along with SMH and the Drilling and Sawing Association. Leading attachment dealers BPH, ECY Haulmark, Inmalo and Worsley Plant kindly took part in demonstrations of their hitches and attachments in the display area. The demonstrations of material processing were proving very popular with the visitors looking to see just what each manufacturer could offer. JCB also provided a wheeled loader in the area to undertake handling duties whilst Inmalo and M O’Brien’s subsidiary, Willow Hire supplied much needed dust suppression. 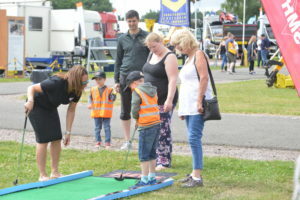 The large marquee also hosted a large number of exhibitors including Nortons, Swanton and Erith Group, HAS, JCB Finance and Hawk Group who kindly brought down their popular simulator. 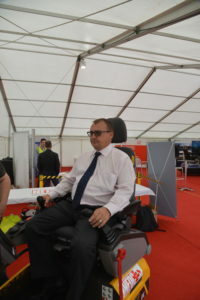 The NDTG also brought their simulator down manned for the three days by Dave Betts who was witness to a Presidents “simulator off” between IDE President David Darsey and NFDC President Paul Brown. The results shall remain a secret though! All in all, the show was deemed a success and both the IDE and NFDC would like to extend their sincerest thanks to all those who participated in the event and for all their hard work which went into making the show the growing success it is.